"This is a unique combination of fruit and vegetable items that makes a good side dish to a grilled meal. Make 4 to 48 hours ahead of use, and keep refrigerated until eating." 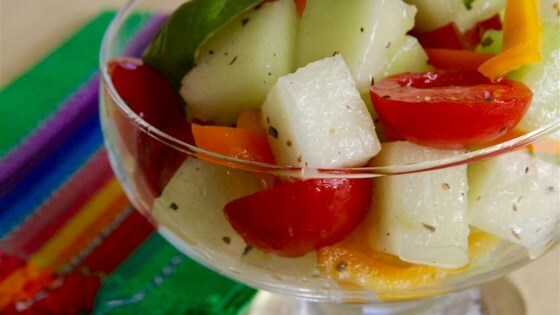 Combine the honeydew melon, grape tomatoes, and green bell peppers in a large bowl. Whisk together the vegetable oil, lemon juice, sugar, basil, and pepper in another bowl, and pour over the honeydew mixture. Cover and refrigerate for at least 4 hours, up to 48 hours, before serving, stirring occasionally. Not very good. Odd to have melon with peppers and tomatoes.